For as long as I can remember my son has known, and has totally followed his own mind, especially where fashion choices have to be made. Although we usually do agree on things, if I ever get it wrong he isn't afraid of telling me so - if that boy doesn't want to wear something then he jolly well won't. We had an incident once - and Charlie was only small - when, forget how expensive the designer jumper was, he didn't like it - it itched him - and he did not want to wear it. It was on him for, oh, all of five minutes and the constant, insistent demands of "Itch Mummy, itch" whilst he tugged away at the sleeves meant that the jumper was never, ever going back on his little torso again. And it really didn't either. And then there are other times when no matter how fabulous a winter coat Mum manages to find for him, there will always be an issue with the colour/length/hood style (?) so back to the shop it goes. These days all of "The Son Shopping" is done with him there in tow or on-line so that he can check through the basket before I put the purchase through. I've learnt the hard way how to make life a little easier for myself. Anyway, when the ever popular, ever fabulous Boohoo people contacted me recently to see if I would like to pick a few items from their very newly launched kiddies range, well, yes of course I would love to take a peek at this. I really love Boohoo for myself you see so I was quite excited at what children's items they would have to offer and I wasn't disappointed. ...well, I do wish the sizes dropped lower than an age 5-6 years because I just know that Willow would look super cute in a few of the girly slogan sweatshirts they have on offer. But for Charlie, well I was impressed and I even reckon I could have picked items for him without showing him first - everything was that stylish, trendy and fun. And yes, that is a jumper that you see - an item Charlie will avoid wearing at all costs and has done for years...probably since that "itch incident" if I'm honest, but he liked this one. All of the items - the fab loose knit, longline, grey jumper plus two pairs of skinny jeans (one charcoal black and the other an acid wash blue) - arrived in record quick time - I think I placed my order in the afternoon and after using a brilliant on-line offer code Boohoo had at the time, everything was with me the very next day - and for free too. Well we thought they were all brilliant. I ordered this particular top because I figured it would be perfect for the colder weather we have hitting us right now and I knew it would look brilliant with either colour jeans. Charlie really likes it and for him, the boy who will dress as casually and as comfily as possible as often as he can, things really do have to be as unfussy to wear as possible to get a thumbs up. And we certainly ticked the right box with this. 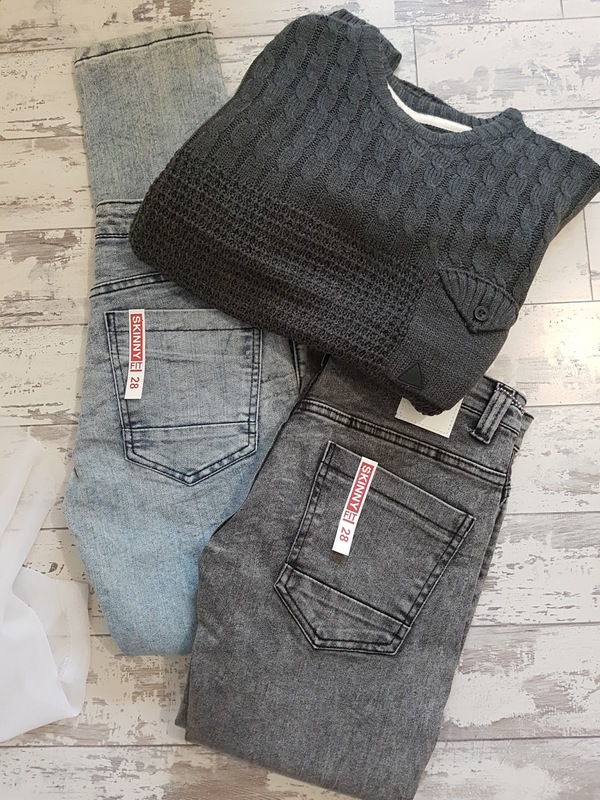 The jeans look brilliant and can be teamed with shirts or jumpers or t-shirts and would fit any occasion really - they particularly help to smarten Charlie up a little bit and certainly were things we needed to add to his wardrobe. Charlie actually thought they were sized perfectly though - whilst he likes the skinny jean style and look, he hates, hates, hates to feel restricted (it's all about the comfort remember) so having them fit a little looser than they perhaps should have suited him just fine. Oh and cost wise, again I thought they were all priced very reasonably - I think the total of all of these items was just over £35 - and for denim (two pairs of denim at that) and a knitted item, I think that's more than great. And they all wash brilliantly too - which is always a bonus.